For our goalkeepers, the main focus will focus on growing their technical & physical base. Our staff will work to grow their interest in the position while holding them to the same high standard that the club holds for its field players. Throughout the year, our staff will cover all 4 Pillars (Technical, Tactical, Psychological & Physical) of goalkeeping over the course of training sessions. Goalkeepers will be encouraged to watch and study professional goalkeepers to learn more about the position and the game. 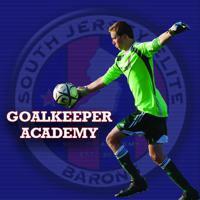 Also, the Goalkeeping Staff will be out to home games to view our SJEB Goalkeepers in action. Trainings will then be tailored to the needs of the goalkeepers and evaluations will be given at the end of the seasons. Physical: footwork, agility, strength, balance, first step quickness. Technical: shot stopping/handling, dealing with crossed balls, breakaway saves. Tactical: distribution, positioning/angle play, defensive set pieces. Psychological: leadership, decision making, communication. Time: 6:00 pm - 7:00 pm. *If a goalkeeper's team has training at the same time, they are to come to goalkeeper training and will be sent to their team's session at the end of our training.